While cigarette use among teens has declined in recent years, hookah smoking appears to be rapidly gaining popularity. A new study finds that 18 percent of high school seniors -- nearly one in five -- reported smoking a hookah, or water pipe, within the past year. The study, published online July 7 in the journal Pediatrics, looked at data from 5,540 high school seniors between 2010 and 2012. The results showed that hookah smoking was particularly popular among teens from families with above-average incomes. "It is a new niche as cigarette use has decreased," study co-author Dr. Michael Weitzman, a professor of pediatrics and environmental medicine at NYU, told CBS News. While cigarette use among in the U.S. has decreased by 33 percent in the last decade, hookah use has increased by 123 percent during the same period, he said. "This is a very frightening occurrence," Weitzman said. The researchers used data from Monitoring the Future (MTF), a nationwide ongoing study of the behaviors, attitudes, and values of American secondary school students. MTF surveys about 15,000 high school seniors in 48 states on a range of topics each year. The study found that hookah use was more common among teens who also smoked cigarettes or used alcohol, marijuana or other potentially harmful substances. Hookah, also called shisha, is an ancient method of smoking, long popular in the Middle East, in which charcoal-heated tobacco-based or "herbal" non-tobacco-based smoke is passed through water before inhalation. 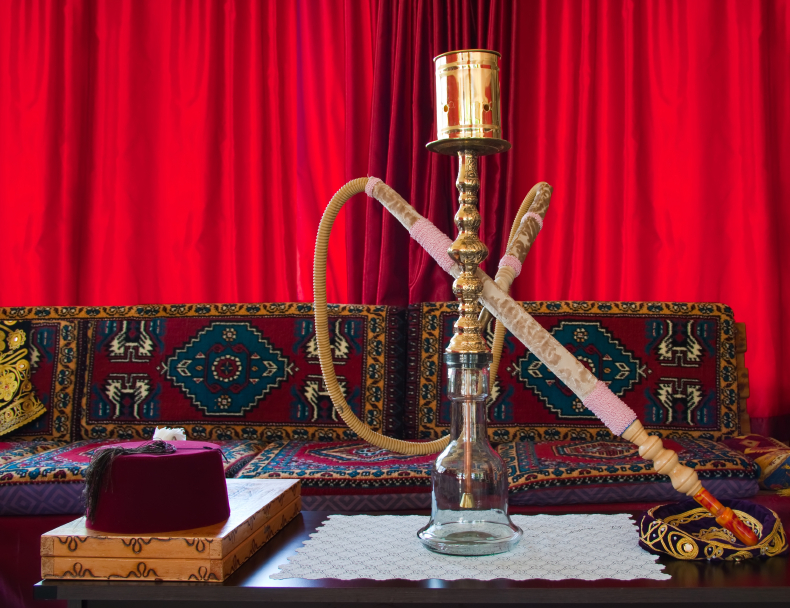 Part of the appeal of hookah lies in the ritualistic way of using it, the researchers said. The product is often flavored, and it does not tend to leave a tobacco smoke smell, which makes it more appealing to teens. "Young people are certainly attracted to things that have a sweet flavor," Dr. Harold J. Farber, pediatric pulmonologist at Texas Children's Hospital and Baylor College of Medicine, who was not involved in the study, told CBS News. Moreover, hookah use is often perceived as safer than smoking cigarettes, which is actually a misconception, the researchers said. Even those types of shisha that do not contain tobacco still pose health risks, according to the Centers for Disease Control and Prevention. "Studies of tobacco-based shisha and 'herbal' shisha show that smoke from both preparations contain carbon monoxide and other toxic agents known to increase the risks for smoking-related cancers, heart disease, and lung disease," the CDC reports. Because of its detrimental effect on health, the hookah habit may at some point lead to an "epidemic of death" among users who are now teenagers, Weitzman warned. A one-hour session of hookah smoking is equivalent to smoking about two or three packs of cigarettes in terms of health risks, Farber said. However, study author Joseph J. Palamar, an assistant professor of population health at NYU Langone Medical Center, stressed that hookah users typically smoke it just once a month or so, unlike most cigarette smokers, who usually end up smoking on a daily basis. This may change though, as hookah pens, similar to e-cigarettes, are becoming more popular, he said. So, is there anything adults can do to discourage this growing trend among teens? Farber recommended raising the minimum age for buying smoking products to 21; in most states the legal age is 18. He added that parents should talk to their children about the harmful effects of using tobacco products on health. Palamar agreed, but noted, "We can't exaggerate messages" about the effects of hookah use. He told CBS News that being honest with kids about the real health consequences of hookah and other potentially harmful substances is extremely important, so that they find these messages believable and take them seriously.